Stairs for Dogs was originally created to be "your total resource for ramps and stairs for dogs". We have tried very hard and really enjoyed being your complete resource when you are making a decision to purchase a stair, step or ramp for your beloved pet. Our reviews of the many dog stairs, steps and ramps that are available through Amazon have helped numerous dog owners, like you, ensure that you are not wasting your time or money and are choosing the right product for your situation. As time has gone on, we have become aware of many different types products available for dogs that our customers would like the same thorough and detailed evaluations in order to make an informed buying decisions. Products like dog beds, dog crates and dog fences as well as their accessories are commonly purchased along with the stairs and we are in the process of reviewing and posting those for you as well! 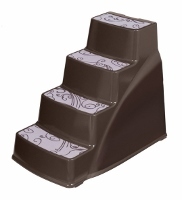 One additional feature that we are now integrating into our website is our very own Stairs for Dogs Store. Our customers have consistently rewarded our hard work and thorough reviews by “clicking” through to Amazon to make their purchases. Now you can make that same purchase, or purchase other products, without leaving our website (but still buying through the most trusted online retailer, Amazon)! You can access our store directly from the link above, or by clicking on the "Our Store" link in our header. Thank you for being our next customer! 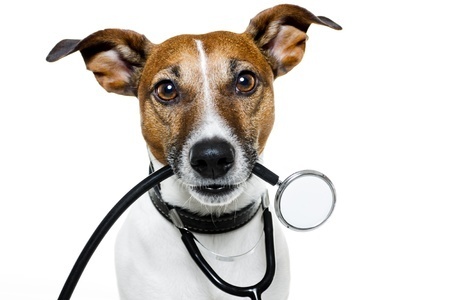 Does your dog suffer from hip or joint problems? Do you have an adorable, smaller dog that just cannot jump high enough to get to its favorite spot; the bed, sofa or chair? Or do you just need to give your back a rest from lifting your dog so they can be closer to you? At Stairs for Dogs, we want to help you be able to choose the right stair system for your dog regardless of whether you have a larger dog that is suffering from hip dysplasia or other joint problems or small dog that simply cannot reach the bed by itself. We have ramps for your dog to assist getting them in and out of your car as well as ladders and ramps to help your dog to get out of the swimming pool. You will be surprised with the wide variety of stairs available for your dog that are offered to help you and your “best friend” live an enriched, better quality of life. Stairs, steps, and ramps for dogs come in a variety of materials. From high density foam with a cover made of sheepskin or other soft covers, to the more durable plastic and wood constructed stairs and metal dog ramps. Some of the stairs, steps, and ramps are made to fold and are portable; while others are designed to be left in place for frequently visited spots. 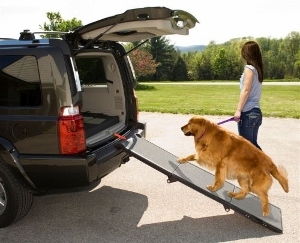 There is even a hitch mounted step for your dog to make it easy for them to climb into the back of your SUV or truck. Since we do not manufacture or directly sell the Stairs for Dogs, our reviews are completely unbiased. So how do we afford to maintain and grow this website? We have links to products that you can buy directly from Amazon and if you decide to purchase a stair or ramp for your dog and you click on one our links we will receive a very small commission, but there's no increase in the amount that you pay. If you have found this website helpful in your decision making process, we would appreciate your support. No matter what the reason you are looking for stairs for your dog, we want to help you find the right product for your dog’s needs and your peace of mind! The pet stairs by Solvit are an ideal and safe way to let your dog access their favorite napping spots in the house or join the family on the sofa for Saturday night movies. The safety side rails have been added with a view to help your pet climb up without tripping or falling over sideways. This feature is especially helpful if you have a little pup that is still the learning the balancing act. The biggest advantage of these pet stairs is that they are extremely sturdy and stable despite being so lightweight. With a capacity to support weight up to 120 pounds, these make for an ideal choice for small and medium sized dogs. Read the complete review of the PupStep Plus Pet Stairs by clicking here! Pet owners are often confused about the decision about whether to bring home a ramp or stairs for their pets. Pet Studio seems to have dealt with that dilemma and simplified the choice with this Ramp Step. 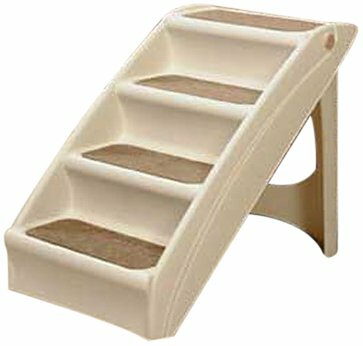 These innovatively designed pet stairs are not only easy to fold but can also be converted into a ramp. You can use it as a set of stairs inside the house, and turn it into a ramp while helping your pet inside or out of a vehicle. The carpet finish on the steps is designed to provide an anti-skid quality to these steps, making them an a perfect choice for aging dogs. With its wooden frame and novel design, these steps are sturdy and can hold up to 130 pounds of weight. 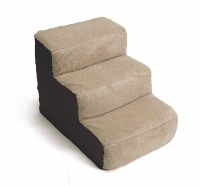 Read the complete review of the Ramp Step by Pet Studio by clicking here! The Deluxe Pet Steps by Brinkmann Pet is an ideal choice for small to large sized dogs, as it can support a weight of up to 200 pounds. 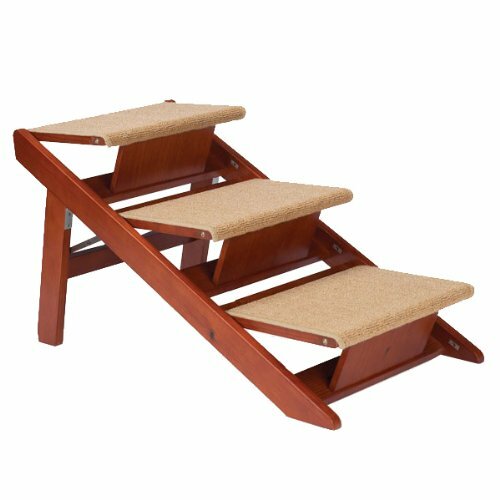 Made from an ultra-light yet sturdy material, these pet stairs are meant to offer added cushion and extra comfort to your dog. These are suitable for both pups and aging dogs, given their cushion texture designed to provide extra comfort and features such as anti-skid bottom. Read the complete review of the Deluxe Pet Steps by Brinkmann Pet by clicking here! 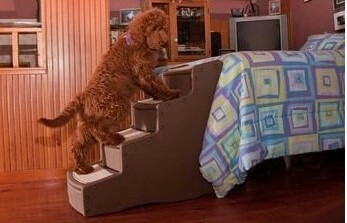 The weight and size of the dog is often one of the biggest considerations when buying pet stairs. But what if you own more than one dog and that too, of varying breeds? 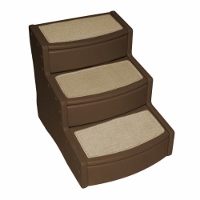 Easy Step by Pet Gear may be the answer to your hunt for ideal stairs for dogs. Broad, sturdy, with deep landings and rubber grippers on the bottoms, these are suitable for both small and large dogs. Read the complete review of the Easy Step by Pet Gear by clicking here!